It’s been a while since my last post — I know, I know. I could make up wild excuses, beg forgiveness, blame other people for my absence. Instead, I will simply say that sometimes life just plain gets in the way of all the other stuff I have waiting on my to-do list. That said, I offer you not one but two — count ’em, two — posts today. One savory and one sweet. Just like me. Staging an unplanned life reinvention at about the time I should be jotting a retirement date in my day planner is depressing enough. But doing it during a recession of epidemic proportions just might push me over the edge. I can go from good days to bad days in the blink of an eye. Yesterday was a good day: productive, busy, fulfilling. Today, I feel like a fish in dangerously shallow water. I flip-flop about my home office in an uphill attempt at survival. I feel anxious, as if I’m in the last 30 seconds of a timed college exam, only to glance down at my paper and realize I’ve been writing with invisible ink! On days when my most productive activity is gritting my teeth until my jaw aches, I force myself to stop and do a little soul searching. If I don’t feel creative or useful at the computer, I take a good look around the house to determine where my attention might be better focused. And that usually brings me to the kitchen. Like falling onto a plumped down comforter at the end of a long and exhausting day, my kitchen welcomes me with open arms; it celebrates my creativity and toasts my culinary value with high-end champagne. Or a sparkling wine from Costco. The warmest room in my house holds serenity for me, and not just because it happens to be the most organized room in the house. When I enter my large, galley-style kitchen, I enter a world far more comforting than that which is currently snubbing its nose at me. When highly discombobulated days stretch my patience to fraying condition, I wave the white flag and admit I need a good perk-me-up. And that involves not only eating something yummy, it means creating it as well. Today, every fiber of my being is longing for a moist, mildly spicy carrot cake from my past. 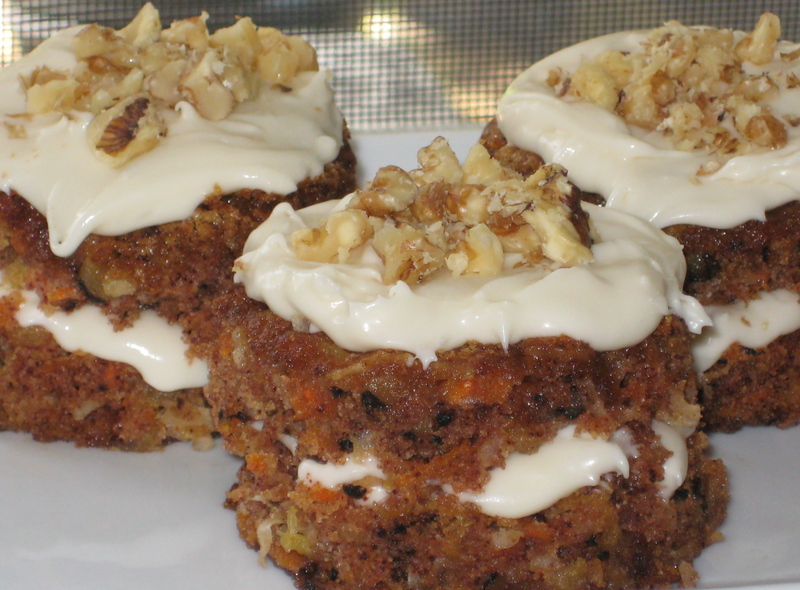 A wonderfully generous indulgence, carrot cake offers the consumer two important rewards. First, it will satisfy even the most stubborn sweet tooth as well as anything else on the dessert menu, and second, if you think broadly enough, you’ll realize you’re actually eating vegetables for dessert. How cool is that? 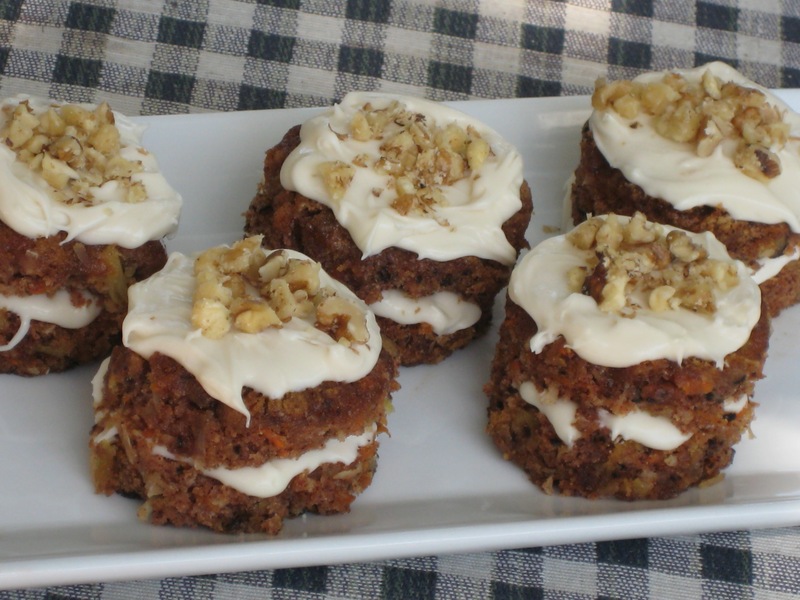 Pretty carrot minicakes, all in a row. In anticipation of the relaxation that baking promises, and the accompanying feeling of accomplishment, I decide to — no big surprise here — amp up Mom’s regular recipe with a nod to Polynesia. Introducing my tropical carrot minicakes. Not to be confused with cupcakes, these little beauties are the perfect indulgence for a day when you really need a perk-me-up, and a darling one at that! And when arranged on a tiered cake stand in the middle of a dessert buffet, well, it’s as if Marilyn Monroe just walked onto the set of Real Housewives. Classy, beautiful, and oh, so sweet. Using a sharp knife, slice each minicake in half horizontally to make two cake rounds. Frost the now-exposed top of the bottom half, place the top half on top of that, then frost the top of the minicake. Garnish with a sprinkling of chopped walnuts or toasted coconut. This entry was posted in Comfort Food -- Sweet, Desserts and tagged carrot cake, cream cheese, Desserts, frosting, individual sweets. Bookmark the permalink. Found a link to this blog entry over at Twitter. Thanks for posting it. Yes, I’ve been a professional writer and editor for many years. And thank you for the compliment — and for commenting on the blog. I made these awhile back and my family LOVED them. I wasn’t expecting much and was surprised at how good they are. I think even with your frosting changes they look beautiful and I love the thick coat of frosting. Yum! So glad to hear that, Jenish! The frosting is often the best part of life! Hang in there sister! I am really enjoying your blog, I love the writing, photography, your humor, and heartfelt thoughts. And I love the idea of those mini cakes. That means I can have 10 for breakfast, right?